An image of the Readhead War Memorial. South Tyneside is set to welcome a royal visitor to mark the rededication of a newly restored war memorial. His Royal Highness The Duke of Kent will visit the Borough on Thursday 23 October when His Royal Highness will attend a special ceremony to celebrate the restoration and relocation of the Readhead War Memorial. The memorial commemorates workers from the former Readhead's shipyard who served during the First World War. Following years of natural deterioration, the plaque has now been restored back to its former glory and will be given pride of place at the new Harton Quays Park on South Shields riverside. His Royal Highness, accompanied on his visit by Her Majesty's Lord Lieutenant for Tyne and Wear, Sir Nigel Sherlock, will be invited to lay a laurel wreath at the foot of the memorial as part of the Service of Rededication. The Mayor of South Tyneside, Councillor Fay Cunningham said: "We are thrilled that the Duke of Kent will be coming to South Tyneside for the rededication of the Readhead War Memorial. "It will be a very special occasion remembering local workers, our fallen heroes and all those who sacrificed their lives to fight for our country. To have a member of the Royal Family join us to pay tribute at our event is a real honour. It will be a day to remember for all those involved." Arranged by the South Tyneside Armed Forces Forum, the rededication service will include prayers led by Father Chris Fuller of St Hilda's Church and a blessing from Reverend Paul Kennedy of St Michael and All Angels Church. The short ceremony will be attended by members of the South Tyneside Armed Forces community and will involve the Durham Light Infantry Association buglers and a piper from 101 Northumbrian Regiment, Royal Artillery. The Readhead Memorial was originally unveiled in November 1921 by James Readhead in honour of 57 of his employees, who did not return from the Great War. Their names form part of the inscriptions. 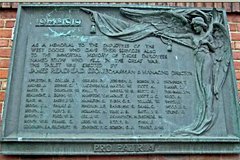 After the shipyard was taken over by Swan Hunters in 1967, the war memorial was left without maintenance for many years before being salvaged from the former yard in 1999 and placed on the side of a Port of Tyne warehouse. The restoration and rededication of the tablet coincides with the 100th anniversary of the outbreak of the First World War, which claimed the lives of more than 2,000 men from the old Borough of South Shields. Councillor Ed Malcolm, South Tyneside's Armed Forces Champion invited His Royal Highness to attend the ceremony. He said: "The rededication of the Readhead War Memorial will be a very poignant moment for our armed services community and for the families of the shipyard workers who sadly did not come home. It will also be a proud occasion for all those involved in restoring and relocating the memorial and I'd like to thank everyone who has supported our Armed Forces Forum to make this possible. "We are delighted to be able to find a fitting new home for the memorial. It will take pride of place at our wonderful new Harton Quays Park, which has a direct line of sight along the River Tyne to the former Readhead's Shipyard. This way, more people in the local community will get to see it and remember, not just on special occasions but every day of the year as they enjoy a riverside walk or visit the popular Customs House. "The Readhead Memorial is such an important part of our history and heritage and it is a great privilege that His Royal Highness The Duke of Kent will be joining us for this special day." The Duke's visit is the third royal visit to take place in South Tyneside in the last year. It follows HRH The Princess Royal's visit to Marsden Road Health and Wellbeing Centre, the Mission to Seafarers and MI Dicksons Ltd last January and the opening of Haven Point swimming pool and leisure complex by HRH The Duke of Cambridge in November 2013.